Please review the terms below prior to any download, purchase, or usage of our software. You must agree to the Software License Terms below for the software you are purchasing. You may contact us if you have any questions! If there are any issues expanding the FAQ questions see All FAQs and Terms (Quick Links) for single page versions of all terms and conditions. A subscription may be cancelled at any time without disruption in service for the remainder of your subscription term, however no refunds will be given for automatic renewals. Terms and conditions are subject to change at anytime without notice. You agree that all matters relating to your purchase or use of software, including all disputes, will be governed by the laws of the United States and by the laws of the State of North Carolina without regard to its conflicts of laws provisions. You agree to the personal jurisdiction by and venue in the state and federal courts in Guilford County, North Carolina, and waive any objection to such jurisdiction or venue. We wish to keep our users informed on important developments related to our software, such as CryptoPrevent, so we ask that you give us a valid email address for important future announcements from our Foolish Newsletter. You may ‘opt-out’ by simply ignoring the ‘opt-in’ email. 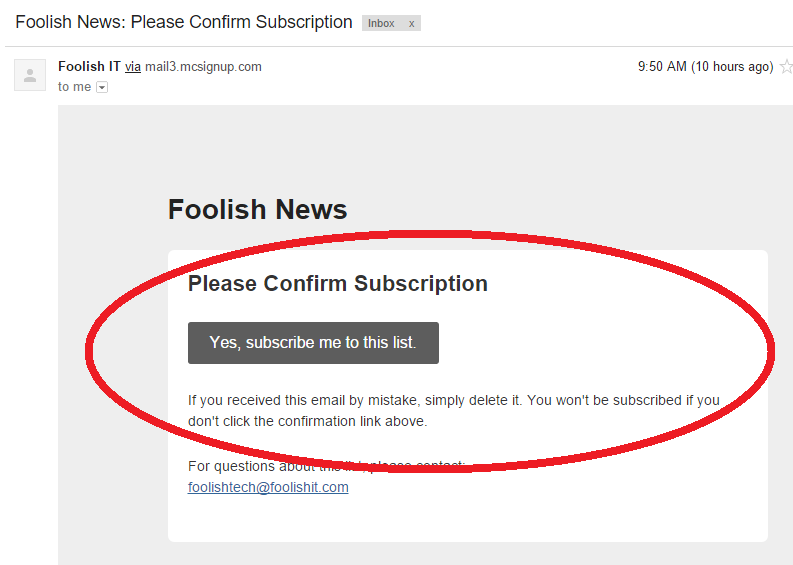 As you MUST confirm the subscription by clicking the button in the email you will receive, simply ignoring this email is all that is necessary to avoid occasional important announcements. We do NOT use your email for any other purpose, nor will we ever give/lend/lease/sell it to any third party! We realize some may refuse to share your email address with us, and while we understand (we mostly feel that way ourselves as consumers) we ask that you keep in mind our intent. We did after all develop the software you came here to install on your PC. All of our software is either designed to prevent malicious damage, or to repair that damage. It would stand to reason that we would not go against our purpose to disrespect your email privacy. You may also choose to download our software from 3rd party download sites, such as Majorgeeks! Any use of this software requires that the user agree to the terms and conditions as presented here and during any installation/usage of the software, whether that user agreed to the terms or is acting on behalf of a user who agreed to the terms. These terms come with no warranties or guarantees of any kind, and the user of this software shall bear sole responsibility for any resulting damages in the use or misuse of this software. Resale is only applicable for the sale to an end user. Once a license has been utilized; it cannot be reclaimed and is non-transferable from the PC it was installed on. You must maintain sole possession of your Unlimited installer, this installer is only for your installation purposes it may NOT be distributed to any 3rd party. The client license is the only item that is resalable under terms, not the installer. If you would like to have installers you may distribute: you must contact us to create an installer of a limited number for that specific distribution and charges may apply for the creation of installers. d7x (and d7II) software is licensed as a subscription service, with variable pricing based on the number of technicians using the product. The software subscription will automatically renew on a recurring billing cycle, to be determined by the chosen subscription term and the original pricing agreement for subscription term renewal; this means your original payment method will be charged on the anniversary date of the original purchase for the originally agreed upon rate. Note that you will be required to agree to the terms of this purchase prior to payment, not only here at the merchant (Foolish IT LLC) website (foolishit.com) but also at the secure pop-up from our payment processor during checkout, and that they have the right to charge your account on a recurring basis according to the specific terms that you agreed to for the product you are purchasing. Older subscriptions using Paypal will have also agreed to their terms on their website, where payment is processed on our behalf. Paypal includes their own terms which state that you agree that Paypal has the right to charge your account on a recurring basis according to the specific terms that you agreed to both here and at their site during checkout. Any subscription may be cancelled at any time without disruption in service for the remainder of your subscription term, however no refunds will be given for automatic renewals. If you do not agree to the automatic recurring billing of a subscription license, you may opt for our d7x Fixed Term Licenses. Fixed term licensing allows you to ‘opt in’ for a renewal at every recurring billing cycle, in order to keep your license active. Fixed term licenses do NOT ‘lock in’ the annual licensing rate, which is subject to the current pricing agreement and terms for manual license renewal at the time your renewal is due. Sales and promotional pricing for any subscription product will only apply to new customers in their first year of subscription service, unless otherwise specifically specified in the terms of the sale advertisement. d7x (d7II) subscriptions are licensed per technician, and an active subscription is required for both licensed usage and updates. Failure to maintain an active subscription will result in revocation of your license and usage rights. As an active subscription holder, you and/or your employees are free to use the software on as many computers as is necessary, apply your own company brand to the application where possible, and charge your clients a fee for it’s usage as you see fit. You may NOT distribute the software or disclose purchase details including any license or registration information to those outside of your employment, including contract companies or employees (even when presenting the original company’s ‘brand’ and logo to the customer. Anyone outside of your company’s direct employment must obtain a separate software license for usage in their own name. You may NOT redistribute the registered version of this application to any 3rd party torrent/download sites, etc., however you may host the application on your own web space for the sole purpose of providing it for you and your employees usage only. Any use of this software requires that the user agree to the terms and conditions as presented during the initial registration of the software, whether that user agreed to the terms or is acting on behalf of a user who agreed to the terms. Upon installation of a licensed copy of CryptoPrevent, it will leave a plain text file name “CryptoPrevent Premium Product Key.txt” in your Documents directory. If you are missing the original installation file associated with your purchase, you can download that here. * For business deployments: the same file is created upon installation of customized bulk and white-label versions of the software which are designed for mass deployment; the product key found in the text file will be unique to allow re-installations on that particular PC without impacting your remaining bulk licensing quantities. Always use the link at the top of the d7x Manual for the most current downloads. See these instructions on managing your subscription through Paypal. Please contact us below with any questions you may have prior to purchase. What can we help you with specifically? * Regarding any purchase, please include the purchase email address if different from the contact email above.